This girl always dreamt about to become a veterinarian. Now she has grown up and she her dream has become true. She is a vet and she is always so friendly. 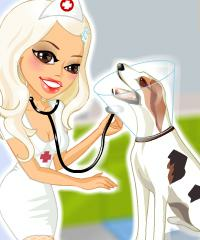 She has opened her own veterinary clinic and she is curing animals every day for the pet owners of the city. Now it is up to you to dress her up in stylish way for her working day. Today she will treat cats, dogs and a turtle.